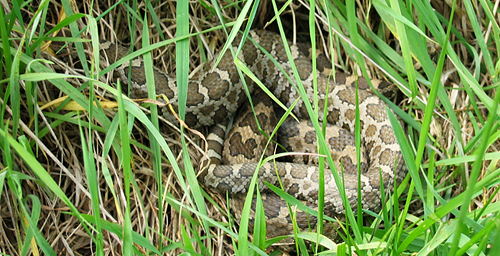 An emerging fungal disease threatens the last eastern massasauga rattlesnake population in Illinois. 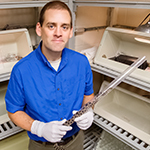 University of Illinois comparative biosciences professor Matt Allender developed a faster, more accurate and less invasive test for a fungus that is killing snakes in the Midwest and eastern U.S. The researchers reported on the test at the 2014 Mycological Society of America Annual Meeting. "We need people to know that they don't have to anesthetize an animal to collect a biopsy sample or, worse yet, euthanize snakes in order to test for the infection," said University of Illinois comparative biosciences professor Matthew Allender, an expert in snake fungal disease. "Now we can identify the infections earlier, we can intervene earlier and we can potentially increase our success of treatment or therapy." Researchers first took notice of Ophidiomyces (oh-FID-ee-oh-my-sees) in snakes in the mid-2000s. Today the fungus threatens the last remaining eastern massasauga (mass-uh-SAW-guh) rattlesnake population in Illinois and has been found to infect timber rattlesnakes, mud snakes, rat snakes, garter snakes, milk snakes, water snakes and racers in several states, Allender said. 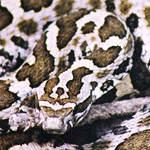 Ophidiomyces consumes keratin, a key ingredient in snake scales. It can cause scabs, nodules, abnormal molting, ulcers and other disfiguring changes to snake skin. Mortality is 100 percent in Illinois massasauga rattlesnakes found with outward signs of infection, Allender said. There are only 100 to 150 massasaugas left in Illinois, he said, and about 15 percent of those are infected with the disease. Allender also is an affiliate of the Illinois Natural History Survey (INHS), part of the Prairie Research Institute at the U. of I. He and his INHS colleague, mycologist Andrew Miller, liken this emerging fungal disease in snakes to white-nose syndrome, another fungal disease that has killed millions of North American bats. Miller and graduate student Daniel Raudabaugh recently published an analysis of Pseudogymnoascus destructans, the fungus implicated in white-nose syndrome, and are repeating the analysis on Ophidiomyces. "The fungus killing these snakes is remarkably similar in its basic biology to the fungus that has killed over 6 million bats," Miller said. "It occurs in the soil, seems to grow on a wide variety of substances, and possesses many of the same enzymes that make the bat fungus so deadly." Other colleagues at the INHS, herpetologists Michael Dreslik and Chris Phillips, have been studying eastern massasauga rattlesnakes in the wild for 15 years, and are working closely with Allender to characterize both biological and health factors that lead to infection. The new qPCR test is integral to this mission, Allender said. It also will help the team develop new therapies to treat infections in snakes. "This work is truly collaborative across disciplines, allowing the team to make advances in studying this disease that haven't been accomplished anywhere else," Allender said. "Our qPCR is more than 1,000 times more sensitive than conventional PCR," Allender said. "We can know how many [fungal spores] are in a swab, and then we can start to treat the snake and we can watch to see if that number is going down." The researchers also are hoping to find new disinfectants that will kill the fungus so that researchers who are studying snakes in the wild will not spread it to new locales on their equipment or shoes. "Some of our preliminary studies show that the common disinfectants that we use are not effective," Allender said. "This fungus overcomes it." 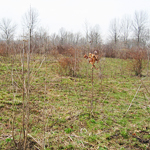 The Illinois Wildlife Preservation Fund Grant Program, offered through the Illinois Department of Natural Resources, provided support for this work. Funds for this program are generated through the tax check-off offered on Illinois income tax returns. To reach Matthew Allender, call 217-265-0320; email mcallend@illinois.edu.